The Lizard Guys, now a division of Juniors' Venture, Inc., is a New Jersey based educational entertainment group that provides live animal presentations with lizards, snakes, turtles, frogs & various bugs. A Typical presentation lasts approximately 45-60 minutes & consists of 5-8 animals. The audience is introduced to each animal, generally one at a time, by one of The Lizard Guys holding it & explaining where the animal would come from, its normal diet, its life expectancy and answering any other questions thrown his/her way. The Lizard Guys has performed over 30,000 presentations for children & adults of all ages at birthday parties, day cares, camps, scouts & special occasions over the last 14 years and hold all necessary permits & insurance for New Jersey & New York. The Lizard Guys is a small group of animal enthusiasts with a patience threshold as high as your tax bill. To use the term "kid-friendly" would be an understatement. The Lizard Guys consist of the same full-time presenters since its inception in 1995 because of their ability to not only educate (anyone can regurgitate information), but to both entertain and control various sized groups of children & adults. •For 1 ½- and 2-year-olds, we will give them an overview of reptiles, amphibians & bugs and show how they differ from us. They will be encouraged to participate by counting the animals' legs and by "hiding in their shell" like a turtle. •For 3- and 4-year-olds, The Lizard Guys will introduce them to words like camouflage and nocturnal. They will also learn about a typical "day-in-the-life" of our animals such as what they eat & their normal habitat. •For 5-year-olds and over, they will learn more grown-up words like carnivore, herbivore & supercalafragilisticexpialidocious. At this age we can get into anatomy (parts of their bodies such as forked tongues and scaly skin) and geography (exotic places they come from such as Africa, Australia & Hoboken). •For 9- to 90-year-olds, a presentation can be crafted by the mind & hands of one of our presenters which older children as well as teens and adults will learn from & be entertained by. The Lizard Guys have experience with groups of all ages, including special needs and senior citizens. No child is too old to learn! 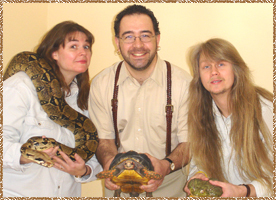 Here at TheLizardGuys.com, you'll find photos and information about many of the creatures we use at our shows and the creatures who present them. For rates, areas we cover and contact information please visit our Booking & Pricing page. 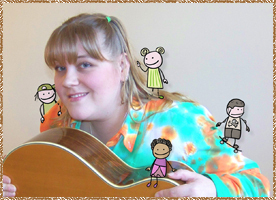 as well as traditional songs at schools and day cares. ← Please click the image on the left to visit our new website. 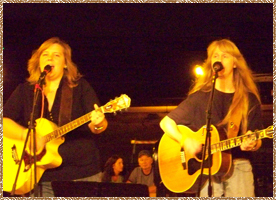 Lisa of "Peas & Carrots Music"
special event for a singin', dancin', rockin' good time!